The Angel Trilogy: Early surreal short films shot in Madrid and Paris. An angel watching over a boy. This angel with these wings, that Melies could have invented, will never leave Arrietta's films. As if it had become his guardian angel, watching over his preserved childhood, a smile haunting his cruelest films... - Emile Breton Arrietta scrutinises and stalks the people he freezes on celluloid in the manner of filmmakers like Jacques Rivette, Jean Eustache and Jacques Rozier, but at the same time in a fantasy atmosphere reminiscent of Jean Cocteau. This symbiosis, which rarely falters, produces highly beneficial effects. - Gerard Courant A young Spaniard outside of every system, of every clique, of every influence, records on 16mm (since cinema for him cannot be just a profession) the quiet heartbreaking delusions that express, better than if he had prepared indictments, the state of mind of a generation for whom poetry today is the only refuge and the only feasible fight ... - Jean-Andre Fieschi, Cahiers du Cinema, 1964 This DVD contains: EL CRIMEN DE LA PIRINDOLA, 1965, 18 min LA IMITACION DEL ANGEL, 1966, 21 min JOUET CRIMINEL, 1969, 37 min All rights of the producer and of the owner of the work are reserved. Unless authorized by the rights holder, no duplication, hiring, lending or public screenings are allowed. For institutional purchase please contact Re:Voir directly. The Angel Trilogy: Early surreal short films shot in Madrid and Paris. An angel watching over a boy. This angel with these wings, that Melies could have invented, will never leave Arrietta's films. 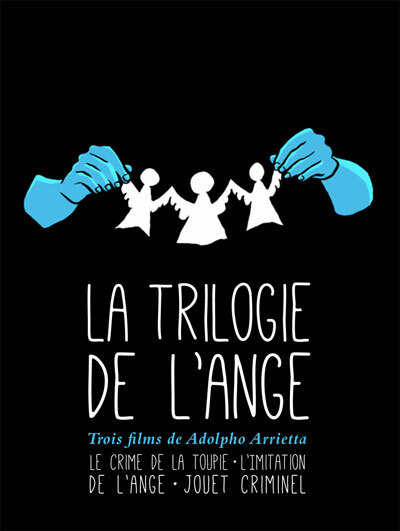 As if it had become his guardian angel, watching over his preserved childhood, a smile haunting his cruelest films... - Emile Breton Arrietta scrutinises and stalks the people he freezes on celluloid in the manner of filmmakers like Jacques Rivette, Jean Eustache and Jacques Rozier, but at the same time in a fantasy atmosphere reminiscent of Jean Cocteau. This symbiosis, which rarely falters, produces highly beneficial effects. - Gerard Courant A young Spaniard outside of every system, of every clique, of every influence, records on 16mm (since cinema for him cannot be just a profession) the quiet heartbreaking delusions that express, better than if he had prepared indictments, the state of mind of a generation for whom poetry today is the only refuge and the only feasible fight ... - Jean-Andre Fieschi, Cahiers du Cinema, 1964 This DVD contains: EL CRIMEN DE LA PIRINDOLA, 1965, 18 min LA IMITACION DEL ANGEL, 1966, 21 min JOUET CRIMINEL, 1969, 37 min All rights of the producer and of the owner of the work are reserved. Unless authorized by the rights holder, no duplication, hiring, lending or public screenings are allowed. For institutional purchase please contact Re:Voir directly. 26 page bilingual English-French booklet with texts by Scott Hammen and Eric Bullot.